The images of Nebulae are sorted by date, latest first. 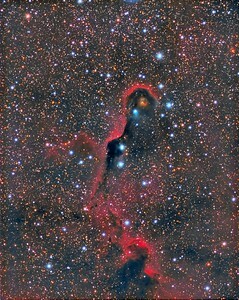 IC1396: Elephant Trunk Nebula. RGB + pseudo-Luminance. 0.96"/pixel image scale. 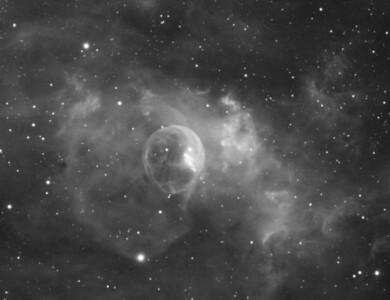 Astrodon Red filter, 17 x 7 minutes, 1x1. 9/18/2015. 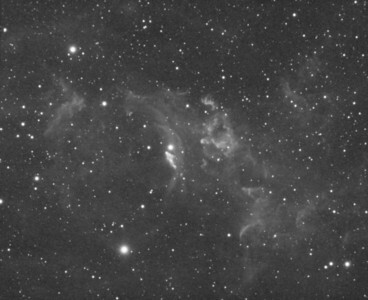 Astrodon Green filter, 16 x 7 minutes, 1x1. 9/18/2015. Had to throw out one sub due to really bright airplane light streaks. 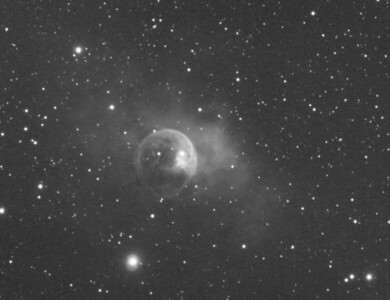 Astrodon Blue filter, 17 x 7 minutes, 1x1. 9/18/2015. TEC 140 APO F/7 with Astro-Physics A-P1100GTO GEM. QSI660wsg. OAG and Ultrastar autoguider, Optec Handy Stepper Motor focuser. Captured and automated with SGP. Calibration and post-processed with PixInsight. PHD2 settings: RA Aggressiveness: 60, RA Hysteresis: 10, Max RA/Dec Duration: 2000, Min Move: 0.45, Calibration Steps: 350msec, Auto/Resist Switching, Extreme dithering and Settled at < 1.0, 3 sec guiding exposure. 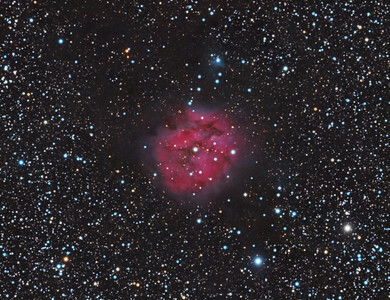 IC 5146: Cocoon Nebula. RGB. 0.96"/pixel image scale. Astrodon Red filter, 12 x 10 minutes, 1x1. 8/30/2014. Astrodon Green filter, 12 x 10 minutes, 1x1. 8/30/2014. Astrodon Blue filter, 12 x 10 minutes, 1x1. 8/30/2014. TEC 140 APO F/7 with Astro-Physics A-P1100GTO GEM. QSI660wsg. Guided with A-P Vario Finder 250mm focal length and Superstar, Optec Handy Stepper Motor focuser. Captured and automated with SGP. 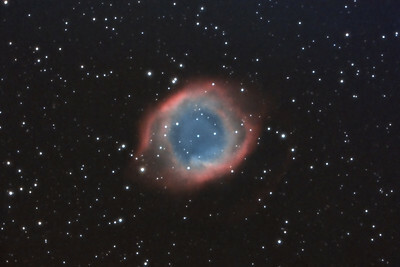 Calibration (including Dark Subtraction) and Post-processed with PixInsight. PHD2 settings: RA Aggressiveness: 90, RA Hysteresis: 10, Max RA/Dec Duration: 1000, Min Motion: 0.25, Calibration Steps: 700msec, Auto/Resist Switching, Extreme dithering and Settled at < 1.0, 3 sec guiding exposure. 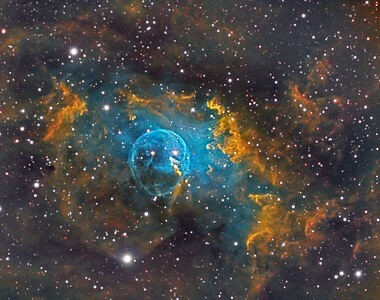 NGC7635: Bubble Nebula in Cassiopeia. 0.47"/pixel. 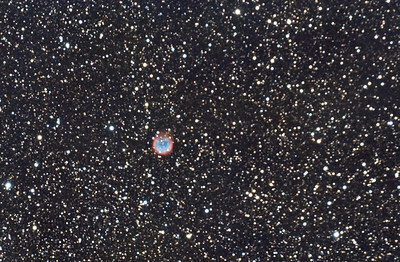 9/15/2012 (RGB) Astrodon Red: 8 x 10 minutes, 1x1, Less than ideal seeing condition Astrodon Green: 8 x 10 minutes, 1x1, Less than ideal seeing condition Astrodon Blue: 8 x 10 minutes, 1x1, Less than ideal seeing condition Created pseudo Luminance by extracting Luminance from RGB using PixInsight and apply to RGB. 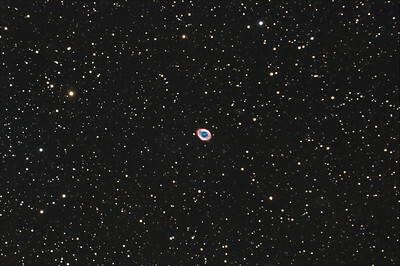 Celestron 8" EdgeHD at F/10 with A-P Mach1GTO GEM. Atik 460EX mono. Hutech OAG. Lodestar. Captured and pre-processed with Nebulosity. Stacked and post processed with PixInsight. PHD settings: RA Aggressiveness: 90, RA Hysteresis: 10, Max Dec Duration: 75, Min Motion: 0.70, Calibration Steps: 125msec, Auto/Resist Switching, Extreme dithering and Settled at < 0.5, 3 - 4 sec guiding exposure. 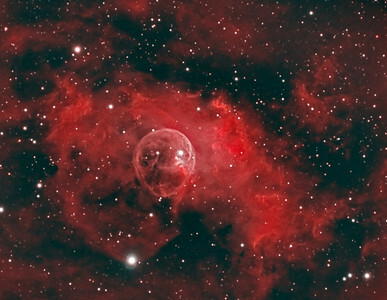 NGC7635: Bubble Nebula in Cassiopeia, Astrodon Ha 5nm filter, 21 x 15 minutes, Unbinned 1x1. F/10, 8/24/2012. 0.46"/pixel. Celestron 8" EdgeHD with Astro-Physics Mach1GTO GEM. Atik 460EX mono. Hutech OAG. Lodestar. Captured and pre-processed with Nebulosity. Stacked and stretched with PixInsight. PHD settings: RA Aggressiveness: 60, RA Hysteresis: 10, Max Dec Duration: 75, Min Motion: 0.70, Calibration Steps: 125msec, Auto/Resist Switching, Extreme dithering and Settled at < 0.5, 3 sec guiding exposure. 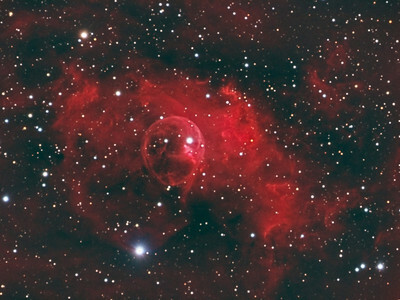 NGC7635: Bubble Nebula in Cassiopeia, Astrodon Oiii 5nm filter, 31 x 15 minutes, Unbinned 1x1. F/10, 9/7/2012. Seeing condition was bad. Celestron 8" EdgeHD with Astro-Physics Mach1GTO GEM. Atik 460EX mono. Hutech OAG. Lodestar. 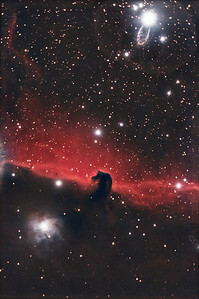 Captured and pre-processed with Nebulosity. Stacked and stretched with PixInsight. PHD settings: RA Aggressiveness: 90, RA Hysteresis: 10, Max Dec Duration: 75, Min Motion: 0.70, Calibration Steps: 125msec, Auto/Resist Switching, Extreme dithering and Settled at < 0.5, 4 sec guiding exposure. 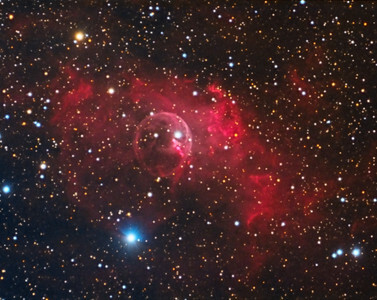 NGC7635: Bubble Nebula in Cassiopeia, Astrodon Sii 5nm filter, 12 x 30 minutes, Unbinned 1x1. F/10, 10/6/2012. Celestron 8" EdgeHD with Astro-Physics Mach1GTO GEM. Atik 460EX mono. Hutech OAG. Lodestar. 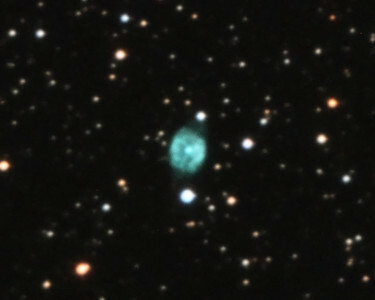 Captured and pre-processed with Nebulosity. Stacked and stretched with PixInsight. PHD settings: RA Aggressiveness: 60, RA Hysteresis: 10, Max Dec Duration: 75, Min Motion: 0.70, Calibration Steps: 125msec, Auto/Resist Switching, Extreme dithering and Settled at < 0.5, 3 sec guiding exposure. 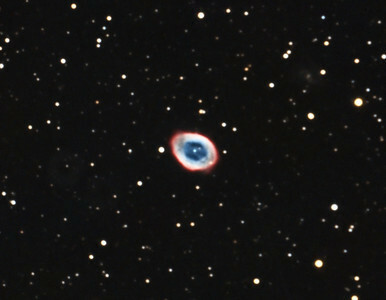 M57: Ring Nebula in Lyra, 12 x 5 minutes, F/10, 7/14/2012. Celestron 8" EdgeHD with Astro-Physics Mach1GTO GEM. SXVR-M25C. Hutech OAG. Lodestar. Capture and pre-processed (BPM, Bias, Flat Calibration) with Nebulosity. DeBayered, stacked and post-processed with PixInsight. PHD settings: RA Aggressiveness: 60, RA Hysteresis: 10, Max Dec Duration: 75, Min Motion: 0.70, Calibration Steps: 125msec, Auto/Resist Switching, Extreme dithering and Settled at < 0.5, 3 sec guiding exposure. SQM: 19.3. 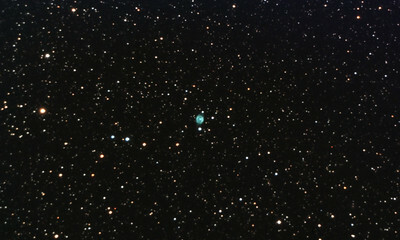 NGC6781: Planetary Nebula in Aquila, 18 x 10 minutes, F/10, 6/24/2012. Seeing was bad. Celestron 8" EdgeHD with Astro-Physics Mach1GTO GEM. SXVR-M25C. Hutech OAG. Lodestar. Capture and pre-processed (BPM, Bias, Flats Calibration) with Nebulosity. DeBayered, stacked and post-processed with PixInsight. PHD settings: RA Aggressiveness: 60, RA Hysteresis: 10, Max Dec Duration: 75, Min Motion: 0.50, Calibration Steps: 125msec, Auto/Resist Switching, Extreme dithering and Settled at < 0.5, 4 sec guiding exposure. 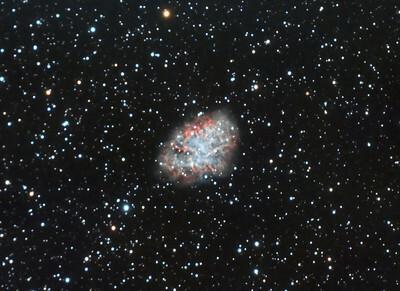 M1: Crab Nebula in Taurus, 30 x 10 minutes, F/10, 1/27/2011. Celestron 8" EdgeHD with Astro-Physics Mach1GTO GEM. SXVR-M25C. IDAS LPS Filter. Hutech OAG. Lodestar. Pre-Processed (BPM, Bias, Flats Calibration and Debayer) with Nebulosity. Post-processed with PixInsight. PHD settings: RA Aggressiveness: 90, RA Hysteresis: 10, Max Dec Duration: 100, Min Motion: 0.50, Calibration Steps: 100msec, Auto/Resist Switching, No Dithering, 0.5 sec guiding exposure. 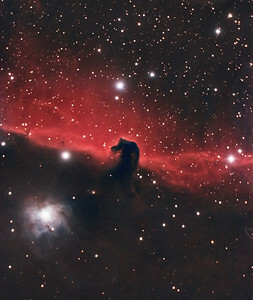 Horsehead Nebula. 11/13/2010. CPC0800 F/6.3 focal reducer. Mitty Wedge. SXVR-M25C. IDAS LPS Filter. Hutech OAG. Lodestar. 24 x 10 minutes. Total 240 minutes. Processed with PixInSight. 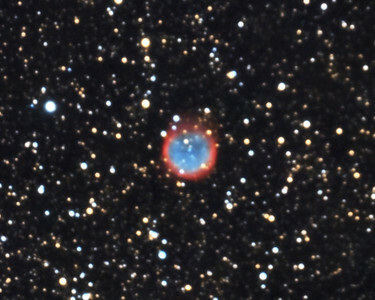 Helix Nebula, NGC7293. 9/10/2010 and 9/11/2010. CPC0800 F/6.3 focal reducer. Mitty Wedge. SXVR-M25C. IDAS LPS Filter. Hutech OAG. Lodestar. 18 x 10 minutes. Total 180 minutes. Processed with PixInsight. 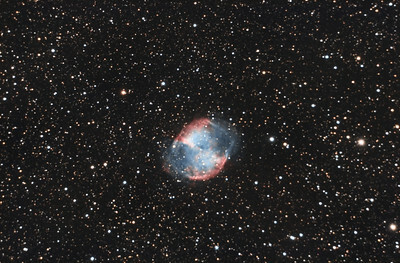 Dumbbell Nebula, M27. 9/2/2010. CPC0800 F/10. Mitty Wedge. SXVR-M25C. IDAS LPS Filter. Hutech OAG. Lodestar. 17 x 10 minutes. Total 170 minutes. Processed with PixInSight. 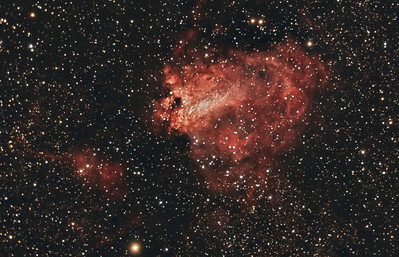 Omega Nebula, M17. 8/13/2010. CPC0800 F/6.3 focal reducer. Mitty Wedge. SXVR-M25C. IDAS LPS Filter. Hutech OAG. Lodestar. 18 x 10 minutes. Total 180 minutes. Processed with PixInsight. 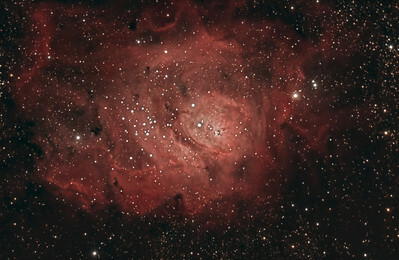 Lagoon Nebula, M8. 8/6/2010 and 8/12/2010. CPC0800 F/6.3 focal reducer. Mitty Wedge. SXVR-M25C. IDAS LPS Filter. Hutech OAG. Lodestar. 6 x 5 minutes and 16 x 10 minutes. Total 190 minutes. Processed with PixInSight. Blue Flash Nebula, NGC6905. 7/23/2010. CPC0800 F/10. Mitty Wedge. SXVR-M25C. IDAS LPS Filter. Hutech OAG. Lodestar. 8 x 15 minutes. Total 120 minutes. Processed with PixInsight. 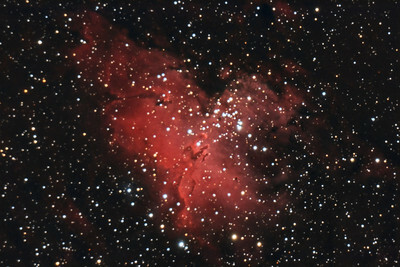 Eagle Nebula, M16. 7/10/2010. CPC0800 F/10. Mitty Wedge. SXVR-M25C. IDAS LPS Filter. Hutech OAG. Lodestar. 24 x 10 minutes. Total 240 minutes. Processed with PixInsight. 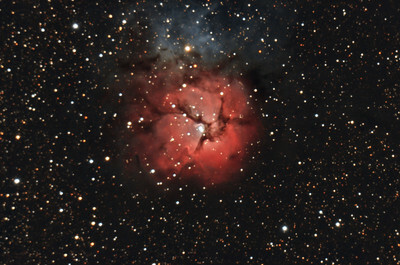 Trifid Nebula, M20. 7/9/2010. CPC0800 F/10. Mitty Wedge. SXVR-M25C. IDAS LPS Filter. Hutech OAG. Lodestar. 14 x 10 minutes. Total 140 minutes. Processed with PixInSight.